Despite the cold and snow, I am beginning to look forward to February. I keep having books released near the end of the month and this year is no different. Seeing one of my books published is always exciting and banishes winter cabin fever. 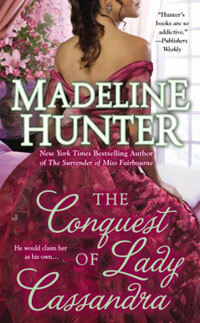 On February 26, The Conquest of Lady Cassandra hits the shelves and the eBook stores. This is the second book in The Fairbourne Quartet and it features the very independent Lady Cassandra, and the charming Viscount Ambury, both of whom readers met in the first book, The Surrender of Miss Fairbourne. Then through my Facebook page I will soon be running a major drawing that I call Lady Cassandra’s Jewels. In the novel, jewels that Cassandra inherited from her aunt and which she sold at auction play an important role. So I decided to have jewelry as the prizes for this event. They won’t be Cassandra’s diamonds and sapphires (I am sure you understand! ), but nice pieces that can be worn without putting on a gown too. If you are on my mailing list you will be alerted to this drawing when it starts. My Parlor Talk group continues to grow and I am doing special things for them with this book. I am having a charm handmade that is a miniature chandelier earring— much like the ones that Ambury bought at the auction and believes were stolen. This is the second charm I have done for my Parlor Talk readers to celebrate a new book, and I hope to continue the tradition. If you want to join Parlor Talk, you can sign up by clicking the Parlor Talk link on my home page. As the big day approaches, I am putting the final touches on the third book in the series. Titled The Counterfeit Mistress, it will be released in September. I will have information about it up on my site in a few months. For now I can reveal that the hero is Kendale. His male friends are convinced he needs a woman, and if ever a man did, it is this one. But the woman he ends up with is hardly the type of sweet innocent Southwaite and Ambury have assumed would one day turn his head. I should get back to those final touches now! I hope you will take a look at Cassandra’s story. I have just posted a second, different excerpt for readers today.